We are grateful to the many groups are involved in the day-to-day running of the Parish. These groups are listed below alphabetically, click on the group name to see more information. You can make contact with these groups through the Parish Office or any of the Priests of the Parish. All of these groups would be very happy to welcome new members. Adoration of the Blessed Sacrament takes place on Wednesdays from 10.30am till 12 noon, usually finishing with Benediction. Among the Adorers we have the Adoration Team. The purpose of this team is to ensure that the Blessed Sacrament is never left unattended during Exposition. Its members commit to being there one Wednesday in 6/7. We are looking for new members, so if you would like to join the team, please leave your name, address, phone number/email in the sacristy and we will put you on the roster. This choir sings at 11.30 am Mass on Sunday mornings in Wicklow and also at all Liturgical Festivals during the year. The choir practises on Friday nights from 7.30pm to 8.30 pm in the Church. Our parish altar servers provide a Ministry of Service at all our Liturgies. Servers are from third class upwards. The children are given full training, for approx. 6 weeks, & they serve the Mass that suits them best. Should you wish to be involved, please contact leave your details in the sacristy before or after any weekend mass or contact the parish office. The Baptismal Team is made up of parishioners who assist in the preparation for and celebration of the Sacrament of Baptism. They represent the larger community in welcoming the child to be baptised into the Christian community with love and prayers for their future peace and happiness in the years ahead. The Baptismal Team meets the parents (usually on the Wednesday evening before the Baptism). Godparents are also very welcome to attend this meeting. They will explain the responsibility of the parents and godparents in passing on the gift of faith to their children. They will also discuss the format for the ceremony and encourage members of the family to participate in the ceremony. The Team would also be available to help out in a practical way on the Baptism day. The Bethany Bereavement Support Group is a voluntary parish-based Ministry, which aims to help the bereaved and grieving. In today’s world people tend to be unaware of the grief associated with bereavement. It is not widely understood that the grieving process may be long and severe. Sometimes a person may need support to work through it in a positive way. It helps the healing process to talk with a trained listener and confront the very strong feelings associated with grief. Bethany members provide one to one bereavement support as needed and also organise public meetings once or twice a year on sonic aspect of bereavement. This group also organise the annual mass for the deceased of the parish during the month of November. The Sodality of Our Lady/Children of Mary, have been active in our town for over 100 years. Its aims are to foster an ardent devotion, reverence and love towards the blessed Virgin Mary through prayer and good works. Meetings are held on the 1st and 3rd Tuesday of the month in the “De La Salle Parish Centre” at 7.30pm. Office, Prayers and rosary are recited. Jobs are then allocated on a monthly basis, these would include Sanctuary Cleaning, Brasses, Altar Linen & Vestments. We also undertake a yearly collection for the SMA missions. Not all people who were enrolled in “Our Lady’s Sodality” in former years attend meetings but are most generous in giving their time to help out with “church work”. however, there is still a great need for new members in the Sodality. If you feel you would like to become a member or even an associate helper, we would be delighted to hear from you. Contact may be made through the Parish Office. This choir sings at the monthly Family Mass and is under the guidance of Lindsey Aherne. The choir are also a very important addition to our Easter and Christmas celebrations. Any child over the age of 7 is welcome and practice is on the Friday evening before the Family Mass. For more information or to join the children’s choir, please contact the Parish Office. The Parish Shop, located at the back of the Church, has a wide variety of books, medals, candles and religious objects in stock. Catholic newspapers are available in the shop every week. The shop is open after all Masses. This team is responsible for the erection of the crib and decoration of the Church at Christmas. These are Religion classes, for all Catholic children who attend non-catholic schools. The classes run through the school term, and are a necessary requirement for any child who wishes to avail of the Sacraments of Communion and Confirmation. More information from the Parish Office. Dominican Convent, Kilmantin Hill, Wicklow. This team organise the monthly Family Mass, the Children’s Stations of the Cross at Easter and the Plays for the children’s/family mass at Christmas. All school going children are most welcome to be involved, and we are very happy to include parents in the participation of the mass too. More information from the Parish Office. Flowers add greatly to the appearance of our Altars. 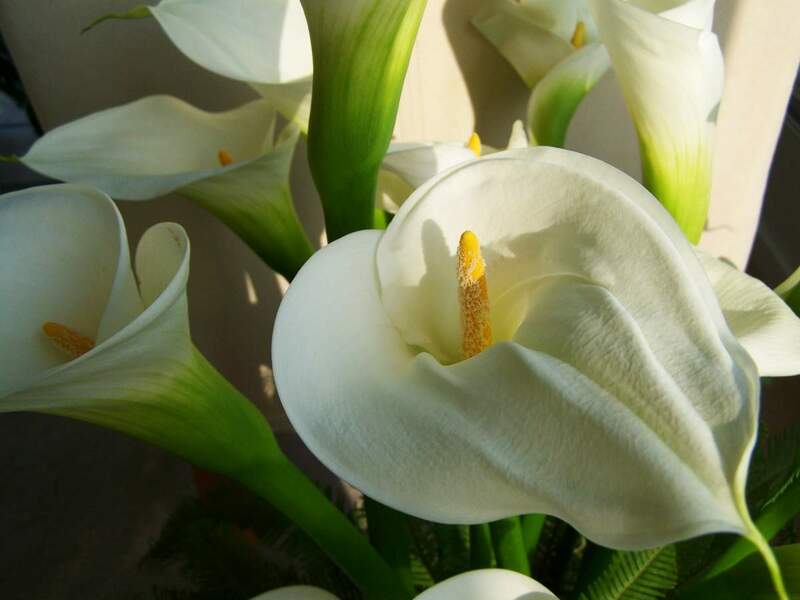 A parishioner or group of parishioners come together on a monthly basis to arrange the flowers. Funds from the Flower Donation Boxes are available to help with the costs. The Folk Group are a youth choir (12 to 18 years) who sing on Saturday evenings at the 6.00pm Vigil Mass in Wicklow, during the school year. Rehearsals are held on Thursday evenings at 8 pm in the St. Patrick’s N.S. beside the Church. New members are always welcome, and especially if they can play an instrument. Rathnew folk group sing every second weekend in Rathnew church, and would welcome new members. The flower beds in the Church grounds greatly enhance the outside of the Church. Members of the Parish look after the flower beds, weeding them and planting new plants as necessary. The Gatekeepers are responsible for the opening and closing of the gates of the school, which provides extra parking during weekend Masses. This group provides light refreshments for all social gatherings in the Parish. This group pick up the collection bags at each Mass and place them in the baskets on the Altar. The Pioneer Association organise the two parish pilgrimages, Knock and Our Lady’s Island. This group is always ready to welcome new members. There are three Prayer Groups in the Parish. St Patrick’s Prayer group who meet on Thursday Nights in the De La Salle Pastoral Centre at 8pm, all are welcome. Our Sacristans help in the running of all that we do within the Church on a voluntary basis. They are responsible for opening and closing the Church, preparing the Altars for all the Liturgies, issuing of Baptismal, Confirmation and Marriage Certificates, booking of Masses. etc. They provide a vital practical service to the Church. A lay community of Catholic men and women dedicated to seeing the goodness of God in everything through living a monastic based life. They offer holistic health support through running a health store/cafe, retreats and a weekly meditation evening. St. Patrick’s SVP Conference is based at Ozanam House on the Lower Mall in the town near the corner of Salt house Lane and adjoining Vincent’s Charity shop. The members meet at 8pm every Monday night except on Bank holidays. Volunteers who help organise parking in the Church grounds during busy Church ceremonies.